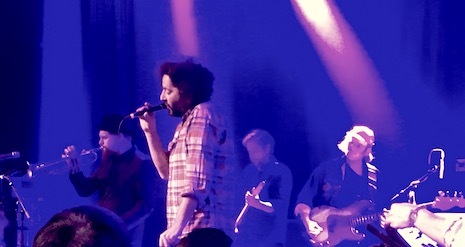 Destroyer at The Waiting Room, Feb. 3, 2018. Trumpeter JP Carter stole the show at Saturday night’s Destroyer concert at The Waiting Room. 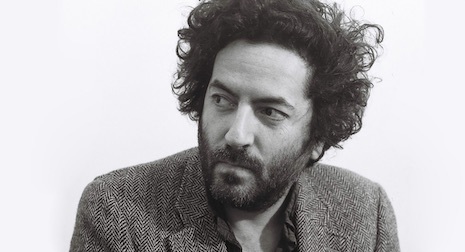 Oh sure, Dan Bejar was in great voice doing his usual vampy singing, but it was Carter and his glowing midnight trumpet that powered the arrangements and left people swooning. Bejar spent the night looking dour, leaning on his mic stand at half mast or kneeling while his marvelous six-piece band (two guitars, keys, bass, drums and that trumpet) crushed each song as tight as any band you’ll ever see on the Waiting Room’s stage (or anywhere). Bejar was spot on vocally, but looked tired and 10 years older than me rather than seven years younger, which he is. 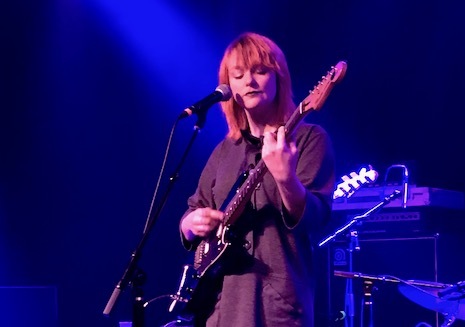 No one says a performer has to look happy up there, most of the ultra-serious ones rarely do, but Bejar looked half-awake or stoned, occasionally grabbing a tambourine and tapping along with his back to the half-full crowd (150?). The set list included a lot of songs off their latest as well as Kaputt and ended with a two-song encore capped with a strong version of “Dream Lover” from Poison Years. Two days after the show, it’s Carter’s dreamy trumpet that still echoes in my mind, pouring out like sonic lacquer, making every song shimmer. I’d pay just to hear that band led by Carter. Mega Bog at The Waiting Room, Feb. 3, 2018. Mega Bog already had started when I arrived a little after 9. Sweet Erin Birgy and a trio of musicians swayed to a jazzy set of pop songs that reminded me of latter-day Joni Mitchell. Birgy’s voice was quiet and quick and matter-of-fact, as if carrying on a private conversation with an invisible friend over coffee. Unlike Bejar, she looked like she was having a good time, telling the crowd to listen closely to Bejar’s song lyrics, and hers as well, though I struggled to make out what she was singing with her low-key, lovely and quiet voice.